Lasith Embuldeniya of Royal College, Colombo was placed second polling 11589 votes pushing Peterite Lakshina Rodrigo ( 10436 votes into third place, while Isipathana’s Salinda Ushan Perera remained at the top with 15,936 votes at the end of the 13th week count in the Sunday Observer/ Mobitel Most Popular Schoolboy Cricketer of The year contest 2016. 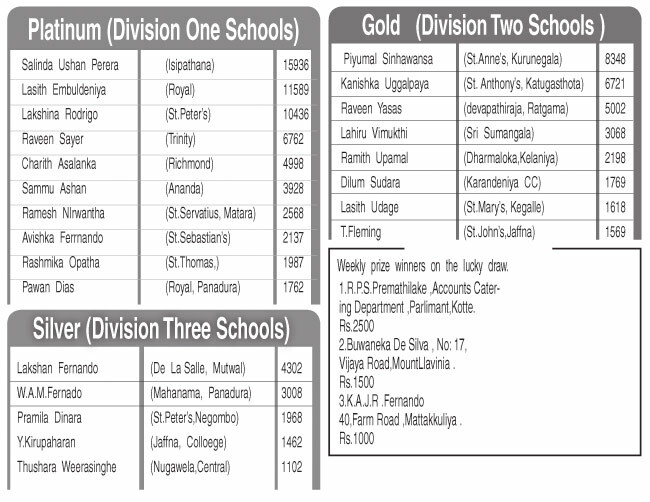 Piyumal Sinhawansa of St. Anne’s Kurunegala maintained his top position in the Gold segment for division two schools polling 8348 votes to Anthonian Kanishka Uggalpaya who is placed second with 6721 votes. With the closing date nearing the contest is becoming more competitive and entries are expected to flow in during the following weeks.